Third District Representative Julian Fraser has confirmed he will be contesting the 2019 General Election with his own political party. While remaining tight-lipped on the party’s name, Fraser said he is now recruiting potential members to join the new political organisation and said the process is going “well”. Fraser declined to comment on the number of persons who have expressed interest in joining his organisation or who have been recruited, so far. The two mainstream political parties in the BVI are the governing National Democratic Party and the Virgin Islands Party (VIP), within which Fraser sits as a member of the parliamentary opposition. Fraser has been at odds with the VIP since he was voted out as party chairman and subsequently removed as Leader of the Opposition — a post now held by First District Representative, Andrew Fahie. 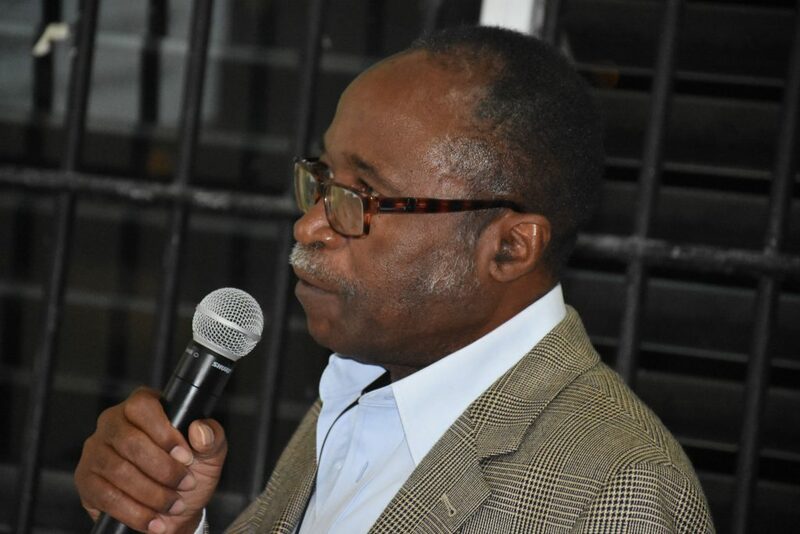 When posed with fresh questions about the condition of his relationship with Fahie, Fraser claimed he has forgotten the Opposition Leader’s name. “I don’t remember his name,’ Fraser said while declining to entertain any further conversation on the subject. Back in 2017 during his final days as Leader of the Opposition, Fraser claimed the VIP had trust issues and ‘deception’ was used to unseat him as party chairman. Fraser was first elected to parliament in 1999 under VIP banner. Over his political career, Fraser has served as Minister of Communications and Works, Minister for Natural Resources & Labour, and as Deputy Chief Minister. Don’t mind the talk, the man have a right to standup if he see the party is making Bias moves. Mr. Fraser I am not your biggest fan but I agree with you this time. Follow your heart. Too much flip flooping going on. “I don’t remember his name”..childish to the highest degree Fraser and you want to lead a nation…I think NOT though! This is old news. This is what happens when children cannot get what they want. Fraser wants people to follow him but intends not to follow no one. He is s——-. Laura you are soo right. His district would be w—- to vote someone like his chi—– self again. Acting like ah t–. Don’t worry, Just Wrong. It will be a party of one. There will be a few people in the Third District who will vote for him, but I predict his vote will be in double digits only. As far as anyone with sense can tell that there’s no fighting with each other here for over a year now. That’s how long Fraser has left the VIP because he wasn’t re-elected as the head of the Party. A sore loser. I am glad you see what is going on here in the BVI, Seer. It’s a circus! Why is it that we as individuals do not want to work with others for the “good” of this territory? Why is it that everyone want to be the head and not the tail or fingers? They all get up in HOA claiming to love the BVI and want its advancement yet slowly killing this territory with their s—– desires. Do we not know the tail; hands, toes are equally important as the head? We need each part of a body to function. Therefore; everybody cannot be the leader. We as people need to get back on track and put “self” aside for the “good” of the territory and its people. He should hope that he has better luck than Alvin Christopher did when he tried to do the same thing in the last election. Maybe…..Al with join him. SMDH!!!! You call that political suicide. They want to quit the political arena but don’t know how, by forming a new party they know much people will not vote anonymously for a new party made up of political —–. You already starting off petty, Mr Fraser?? Remember it gah alot of people don’t like you off of past behaviour such as this that you gah try and win over now that we looking to make a clean sweep of everybody currently in the Cabinet. This is all about POWER and not about country above selfish ideologies and cravings. This one will not fly. The happiest man in Sea Cow’s Bay to hear this news is J—– W–. Here my dear friends is the reason why this gentleman must never be in a seat of ———. By the formation of a new party (which was completely expected) he is declaring that he is not a t—- ——–, that his interest is p——– and not toward the betterment of the ——— and moreover, that he is a m———– obsessed with the need for personal gr— and c—– – his experience bears this out, refusing to back his own party. —— person, wrong timing, completely I’ll advised. A possible name for Frasers new party could be the the “For—– Unity Com—– Kingdom” party ! @sam the man – v funny just realised the anagram ! Just about sums him up…he —- give F…k about others only ———…..
What a c———— human being. Who in their right minds would want — to be premier of the Virgin Islands? They have to be a carbon copy of —. Can’t fathom — representing the Virgin Islands on the international scene. That would be a n——– that — can’t awake from. Fraser needs to submit his retirement letter from politics. Since you have amnesia, let me remind you of the name of the Chairman of the VIP, Leader of the Opposition and the next Premier of the Virgin Islands – ANDREW FAHIE!! More stop lights at the roundabout? Mr Fraser we also remember biwater. Time to retire Sir! You are —- on arrival. Please save us the drama, Mr. S——, —– Hungry man. You and your party is doomed before you get started. Anyone following you are just as ——- and —- hungry and no one wants — to lead this country. Save your face by taking several seats, and please retire before you get fired by the people. “When posed with fresh questions about the condition of his relationship with Fahie, Fraser claimed he has forgotten the Opposition Leader’s name.” “I don’t remember his name,’ Fraser said while declining to entertain any further conversation on the subject.” At best childish. This is poor behaviour from one that wants to serve as Premier of these Virgin Islands. Fraser led one of the two major parties (VIP) he is now decrying. At the polls in 15 under his — leadership, the VIP suffered an embarrassing, earth shattering 11-2 beat down, despite a weakened NDP. The electorate said that it was not into the member’s leadership. Has any attitude change since then? This move is a desperate p—- grab, trying to for— f— the electorate instead of trying to earn their respect and confidence. One cannot lead if one cannot follow. Fraser has not yet passed the followership test. His performance after the VIP election is d——–. Just keeping it real with some tuff love. Moreover, talent alone is insufficient to become a successful political leader. Ego, arrogance…….etc are disqualifiers. Success demands humility,civility, loyalty, unity, patience, good attitude, true compassion, cooperation………etc. It is now confirmed that Mr Fraser is m——- unfit to be Premier of these precious Virgin Islands, because by his own admission, he have amnesia. This further confirms that he is unfit to lead VIP, his new party, or even to represent the 3rd district in the HOA. Please do the hounourable thing and retire Mr Fraser. Your time and season is up! With this attitude it is now clear to me why the VIP removed him as Head of the Party. he has been in the position for a long time and if he indeed want positive change, he should have done it when he was in power. Now, if he wants to build another party, i think he should just be an adviser or founding member. The BVI is at crossroads and who we elect to lead us come next year election could determine the future of the territory. We have looked on for years while the finances of the territory was mismanaged and the pockets of the special interests were lined with tax payers money. We have witnessed unbelievable wastage on projects such as the cruise pier with little to no accountability. I urge people to be careful about the choices and those whom they will choose to represent them and the territory. Many will claim that they are in it for the sake of securing a better BVI but some of them will be in it for themselves. Do not be fooled..
Let’s not waste time here with Fraser. Carry on. 2019 is fast approaching get your teams together and present yourselves to the public. NDP time is not over until Honerable Fahie fend the right people to stand with him amen.